Norland Optical Adhesive 75 is a clear, colorless, liquid photopolymer that will cure when exposed to ultraviolet light. Since it is a one part system and 100% solids, it offers many advantages in bonding where the adhesive can be exposed to UVor visible light. The use of NOA 75 eliminates premixing, drying or heat curing operations common to other adhesive systems. Curing time is remarkably fast, and is dependent upon the thickness applied and the amount of ultraviolet light energy available. NOA 75 is designed to give the best possible optical bond when using plastic to plastic or plastic to glass substrates. NOA 75 has excellent adhesion to cellulose acetate butyrate (CAB) and glass and good adhesion to CR-39, polarized film, nylon, , polyester film, polycarbonate and acrylics. NOA 75 also has excellent clarity, low shrinkage and a slight flexibility that make it superior to other materials for optical bonding. These characteristics are important in order for the user to produce high quality optics and achieve long term performance under changing environments. NOA 75 is cured by ultraviolet light with absorption within the range of 320-400nm long wave UVand 400 to 450nm in the visible light range. 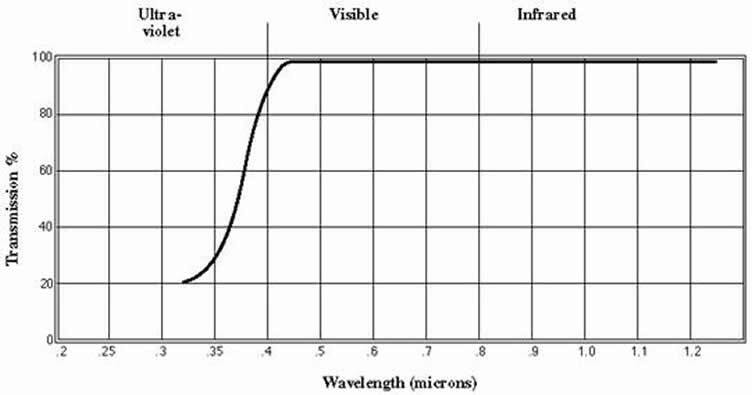 The recommended energy required for full cure is 4 Joules/cm2 for long wave UV and 7 Joules/cm2 for visible light. In most optical applications, curing is done in two steps. A short, uniform exposure, or precure, is used first. The precure time is of sufficient duration to set the bond and allow it to be moved without disturbing alignment. This is followed by a longer cure under UV light to obtain full cross-linking and solvent resistance of the adhesive. The precure can be obtained in 15 seconds using a 100 watt mercury lamp at 6". Where longer time is required for alignment, it can be extended to a few minutes using a very low intensity light source. The final cure can be accomplished in 5 to 12 minutes using the 100 watt mercury lamp depending on the amount of UV energy generated by the lamp. The precure allows the user to align and set the precision parts quickly and minimizes the number of holding fixtures required. After the precure, excess adhesive can be wiped up with an alcohol or acetone moistened cloth. Assemblies should be inspected at this time and rejects separated in methylene chloride. The bonded area must be soaked in the solvent and normally will separate overnight. The time required to break the bond depends upon the extent of the cure and the size of the bond area. Caution should be taken when using methylene chloride as it dissolves many plastics. When fully cured, NOA 75 has very good adhesion and solvent resistance, but it has not reached its optimum adhesion to glass. This will come with aging over a period of about 1 week in which a chemical bond will form between the glass and adhesive. This optimum adhesion can also be obtained by aging at 50° C for 12 hours. NOA 75 can withstand temperatures before aging from -15°C to 60° C. . After aging, when used for glass bonding, it will withstand temperatures from -80° C to 90° C.
Shelf life of the liquid is a minimum of 4 months from the date of shipment, refer to the package label for the actual expiration date, if stored in a cool (5-22° C), dark place in the original container. If refrigerated, allow the adhesive to come to room temperature prior to use. Care should be taken in handling this material. The Material Safety Data Sheet should be read for this product as well as for any associated products such as alcohol, acetone or methylene chloride. Prolonged contact with skin should be avoided and affected areas should be thoroughly washed with copious amounts of soap and water. If the adhesive gets into the eyes, flush with water for 15 minutes and seek medical attention. Use the material in a well ventilated area, otherwise a NIOSH approved organic vapor mask is recommended.